Doggerland, a place situated n the Northern Sea, was sunk after a tsunami, more than 8200 years ago. It is named the Atlántida of the North, because of the similar destiny with this legendary island, mentioned by Plato in some of his most important works. John Hill, from the Imperial College in London, says that this area was abandoned by the tribes that lived 8000 years ago, when the catastrophe took place. The 5 meters high waves probably killed the last inhabitants remained there. Hill and his colleagues made a computerized model, to understand the effects of the tsunami better, which provoked a massive landfall. During the Glacier Era, the level of seas was lower, and Doggerland united Great Britain with Europe. This way, the tribes of hunters were able to walk from England to Germany. The level of seas started to grow 20 000 years ago, flooding the vast region that was situated at a low altitude. A basin was formed in the middle of the land, with the waters of the Thames and the Rin Rivers. The swamps and lagoons formed in this region were probably a true hunting paradise for humans. 2000 years later, the area dried, becoming a small swampy island. Archeologists discovered bones of the animals that lived in this Garden of Eden, as it was named by Bernhard Weninger, from Cologne University in Germany. 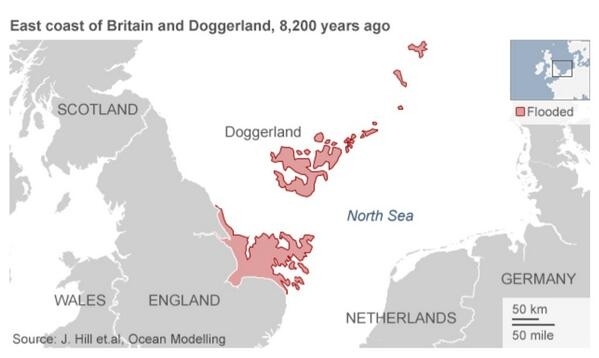 Doggerland covered more than half of the North Sea, from Denmark to England. It’s sunk is considered as the end of the last Ice Age. It is important for the archeologists, as it might give us many testimonials about the life back then. 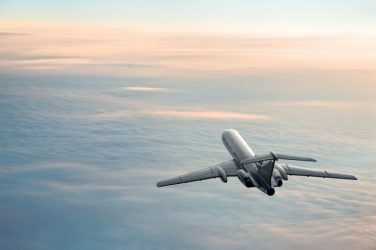 It is believed that the bottom of the North Sea might be the most important undiscovered archeological inheritances of humankind.